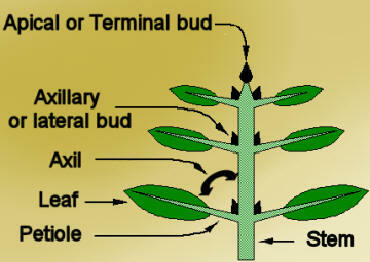 The axillary bud is a bud that develops in the axil of a leaf of a plant (synonymous with lateral bud). The axillary bud is a bud that develops in the axil of a leaf of a plant (synonymous with lateral bud). Axillary buds develop from the nodes which then becomes a new stem. Sometimes from axillary buds instead of branches (axillary shoot) also arise flowers, these buds are called floral buds.